With so many products out on the shelves and so many nutritional guidelines to remember, it can get extremely confusing shopping for healthy groceries. You would think you would be able to to trust packaging, but there are certain nutritional label phrases you should always look out for. You may think just because something says organic means it's good for you, but food companies know how to trick consumers with clever marketing and deceptive terminology (organic foods can sometimes be loaded with sugar and other unhealthy ingredients). "The public expects the FDA to regulate labeling, and it does, to the degree that it sets requirements," says Bert Herring, MD in an interview with Bustle. "It does not inspect every label before a food product is released to the market for accuracy — that’s only done when the FDA receives a significant number of complaints about the product and its labeling." When it comes to looking for good foods, your best bet is to check the ingredients list, which will give you the greatest indication of something is healthy for you or not. Always look for foods with as few ingredients as possible, and avoid foods with added sugars, hydrogenated oils, or excess additives. You should also look out for the below seven phrases, which appear frequently on food products, but have no real meanings. "Natural does not mean healthy, and 'natural flavors' encompasses a wide range of ingredients, many of which consumers would not knowingly choose to ingest," says Integrative Nutrition Health Coach Madeline Eyer over email. For example, monosodium glutamate (MSG) is a popular “flavor enhancer," but it is also a known excitotoxin. "Excitotoxins bind to nerve cell receptors, stimulate the cell and can damage it or cause it to die," she says. Other known excitotoxins can include anything with the words glutamate, hydrolyzed or autolyzed. 2. "Good Source of Fiber"
The healthiest sources of fiber are whole grains, beans, and legumes, and fruits and vegetables, but not all goods marked high in fiber contain these ingredients. "Most of the time, the fiber you're seeing crop up in fruit snacks, packaged bars, and cookies are from 'isolated fibers' like chicory root or polydextrose," says Erinn Gregory, RDN, to Bustle over email. "These types don't have the research backing and typically don't provide the additional health benefits you would get from real, whole foods like oats, flaxseed, or apples." Just because a package says it's made with whole grains doesn't necessarily mean it's devoid of any processed flour. 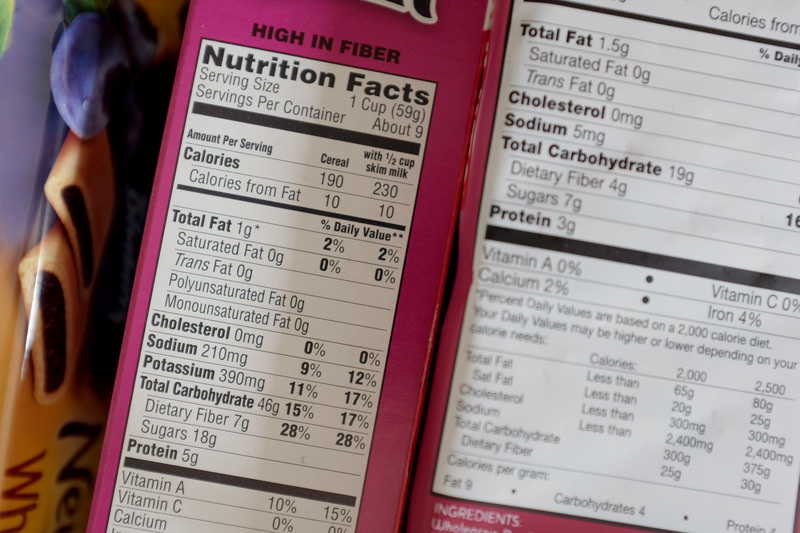 "For a product to be labeled 'made with whole grains,' it only has to contain a minuscule amount of whole grains," says Eyer. "The remaining ingredients can, and often are, stripped of their nutritional value." Look for products that are marked "100 Percent Whole Grain" to make sure you are getting pure whole foods. Although products labeled "sugar-free" may not actually contained refined sugar, they are more often than not replaced with something far worse. "Sugar-free generally indicates the presence of some form of artificial sweetener that the body cannot recognize or process," says Eyer. This can include aspartame, sucralose, which can end up having as many if not more detrimental health effects than regular sugar. For food to be pre-cooked, ready-made, or stovetop-ready, it often contains unhealthy ingredients meant to preserve food for long periods of time. "These keywords are indicators of products that contain high amounts of refined sodium, preservatives, and refined sugar," says Tara Zamani, a Certified Clinical Nutritionist for Content Checked over email. "These additives often negate any of the nutritional value of the food." "Fresh is another word that may not mean what you think," says nutritionists Mira and Jayson Calton over email. "While the FDA demands that 'fresh' food is in a raw state and has not been frozen or subjected to any form of thermal processing or preservation, it does allow for all of the following unappealing processes to take place: waxing or coating, post-harvest pesticides, a mild chlorine or acid wash, or ionizing radiation (irradiation)." Something that is made "low-fat" usually contains high amounts of sodium in addition to carbohydrates or sugar, which, ironically, are the types of foods that our bodies convert into fat. "For years, the government vilified fat and scared us into purchasing starchy 'low-fat' foods," says Certified Personal Trainer and Certified Sports Nutritionist Shane Allen, CPT, CSN, WMS over email. Even if foods do have these type of labels on their packaging, it certainly doesn't mean you shouldn't eat them or should even limit your intake of them. It simply is good practice to be aware of what you're eating and of how labels can often be more confusing than you would suspect.